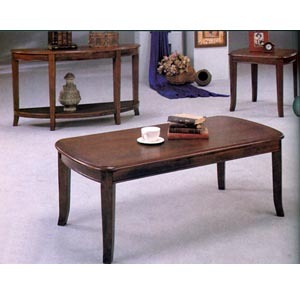 Coffee Table In Rich Brown Finish. Sleek Design, Straight Lines In A Deep Rich Brown Finish. Dimensions: 52L. X 26W. X 18H.. Also Available (Not Included In The Price) End Table: 28L. X 26W. x 28H. ; And Sofa Table, Size: 52L. x 18W. X 30H.. Easy To Assemble.